Torn from the man she loves, Layla Callaway is in the clutches of the enemy, robbed of her freedom and stripped of her power. She’s determined to stay alive for her family, keeping hope in her heart for her hero, but when devastation strikes, her sanity takes a hit. Quin Kavanagh lives for Layla. Now that she’s gone, he’s suffering a slow death. There is no limit to what he’d do to get her back, but the clock is ticking, and every direction he turns leads to a dead end. With lives on the line and hope slipping away, Quin puts his faith in two unlikely allies. But even if he gets Layla back, she won’t be the angel he remembers. With Layla in captivity and their adversaries outnumbered, the Dark Guild holds the power, and they plan to use it to unleash hell on earth. Thank goodness book #6 released the same day as #5 because it would have been a long and excruciating wait! When you start Devastation go ahead and prepare yourself to read it straight through. This book is packed full of drama, and you’re going to be on pins and needles up until the last chapter. Now that Layla has been taken captive by the Dark Guild we cannot help but worry for her life and with no trail to follow we are equally concerned for Quin and the breakdown we know is certain to follow in his desperation. The forced time apart from one another takes it’s toll on them each. Quin’s world has once again been turned upside down, and being forced away from Layla completely wrecks him not only emotionally but also physically. However, he holds onto his hope of finding Layla, absolutely refusing to give up and now with unwavering confidence in his love and relationship with Layla he joins forces with those he once considered threats. Layla’s strength, generosity and humanity continues to amaze me. She truly must be an angel! I really enjoyed the scenes of her time in captivity and watching how they changed her. She isn’t the girl we first met in Descension, the dangers over the last several months have striped her bare and left her somewhat jaded. At times I worried she may never find her way back. And while it’s impossible to remain unchanged after all she has been through I was so pleased to see pieces finding their way back and I love and appreciate the woman she has become. Her compassion sets her apart from any other character I’ve met and truly enriches the entire experience. Oftentimes Layla draws strength from her love for Quin, but she also isn’t afraid to take charge and call the shots when needed. She is after all a woman scorned and those who hurt her should be worried for their own lives because this women will let nothing stand in the way of the ones she loves. 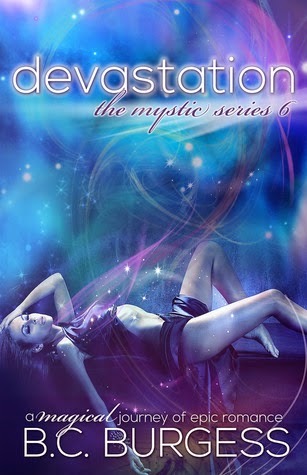 In my opinion Devasatation is the most action packed book of the series yet and will at times leave you breathless. I loved every minute of my time with this book. I would even go as far as to say it’s my favorite one of the series. How can the books continually get better and better? It must be because they are coming from a great author who has the perfect knack for storytelling!